The kingdom of heaven is like a merchant seeking fine pearls, and upon finding one pearl of great value, he went and sold all that he had and bought it (Matthew 13:45-46). The merchant sold all he had for the pearl of great value because he was able to recognize its value and beauty. Once he possessed it, however, he was functionally poor (in the sense he couldn’t buy food, clothes, pay rent, etc). This parable is not about using God to become wealthy, but it’s about the worth of the Kingdom of God – the worth of ‘possessing’ Jesus. In the parable, the merchant sees its worth. Now, in order for him to become a merchant, and to be able to recognize the worth of the pearl, he had to be taught. He had to apprentice under someone (probably his father, in that culture). This is where we see the importance of discipleship in the Christian life. Teaching, but also modelling and apprenticing others in the ways and teachings of Jesus, “teaching them to obey everything [He] commanded…” (Matt. 28:20). The challenge for all Christians is to see the beauty and glory of Jesus so much that we devote our lives to Him, “selling all that we have,” and “taking up our cross daily and following Him.” And the job of mature Christians is to help others in the church to see Jesus properly (that is, to see His beauty, glory, and inestimable worth). This is especially true for church leaders – elders, deacons, teachers, worship and small group leaders, and of course, even the pastors. Having said that, we can only train others as far as we ourselves have gone. 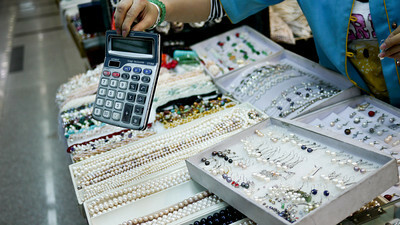 If I’ve only studied to learn about the size, colour, and shape of pearls, then that will be all I can teach and show. I won’t be able to teach about the lustre, surface quality, or nacre quality of them. The other aspect of this is that being able to see Jesus’ true worth is a gift and grace from God. So maybe it’s not so much teaching and modelling to others how to see Jesus, but to see Him better, or, to see Him more accurately. And so the challenge for me then is to know Jesus intimately and recognize His presence, work, glory, and beauty in and around me and in and around the life of those around me, in order to point them to Jesus to be able to recognize Him better themselves. And as we see the glory of Jesus, we are changed more and more to be like Him (2 Cor. 3:18). One of the greatest killers of community is unforgiveness. There can be a myriad of reasons we may harbour unforgiveness against someone, from minor things like “he didn’t put the toilet seat down again,” to the horrific like the continued Boko Haram atrocities, the Charleston church shooting, or Guido Amsel sending bombs to his ex-wife and their lawyers here in Winnipeg . In church settings the effects of unforgiveness always lead to disunity; fellowship is broken, and I’ve heard of people going to the same church for decades and never speaking to each other. This is very sad, and extremely contrary to the way of Jesus, who at the end of His life prayed for our unity (John 17). And while forgiveness doesn’t negate consequences (a forgiven murderer still goes to jail, a forgiven slanderer still needs to recant their words), we know that repentance or the lack thereof is not dependent on us forgiving. This makes it one of the hardest things we can do; and also, one of the most Christ-like. As I know only too well, the act of ‘dying to self’ is greatly needed in order to forgive sometimes. But because we have been forgiven by God, God expects us to in turn give that same grace to others. Jesus’ words in Matthew 6:14-15 sound harsh to our ears: “For if you forgive other people when they sin against you, your heavenly Father will also forgive you. But if you do not forgive others their sins, your Father will not forgive your sins,” but there’s really no way to understand these words except at face-value (this is not to say that we earn God’s forgiveness by works of our own forgiveness of others, but shows the seriousness with which God expects us to love others the way He loves us (see Jesus’ parable of the unforgiving servant in Matthew 18)). Often forgiving someone is not enough to restore unity, however. At least not the way we practice forgiveness today (a shallow, un-christ-like type of forgiveness which says the perpetrator is forgiven, but will never be trusted/spoken to/loved again). This is why Miroslav Volf, in his “Exclusion & Embrace“, talks about the need to forget, or “nonremembering,” in order to forgive in such a way that unity and relationship can be fully restored. This nonremembering properly takes place after “perpetrators have been named, judged, and (hopefully) transformed” (131), and after the victims are safe and have healed/mourned. For without it “as long as it is remembered, the past is not just the past; it remains an aspect of the present. A remembered wound is an experienced wound” (133). This forgetting is not a complete obliteration of the memories, which is frankly impossible, but a sort of “backgrounding” of the memory that allows us to move beyond the offense and pain of it. Volf says that this is the final, and most difficult part, of reconciliation (131). This week, before next Sunday, examine your heart and see if you are holding any unforgiveness or bitterness towards anyone in your community; and if you are determine to forgive them in the strength of God’s forgiveness given to you. And keep forgiving them for as long as you need to in order to “forget.” It will be difficult, but it will be more worth it than you can imagine beforehand. Stumbling Zombie · Insights of a zombie stumbling towards the Light.